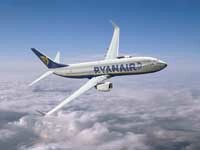 Budget airline Ryanair has reported a 10.9m euro ($15.3m; £9.5m) net loss for the October to December quarter. However, the loss was much smaller than the 101.5m euro deficit it reported for the same period in 2008. Ryanair said the result had been helped by a 37% fall in fuel costs, which had offset a 12% fall in fares. It had also cut some loss-making routes. The carrier also raised its full-year profit forecast, saying it now expected net profits of about 275m euros. This forecast was up from its previous estimate of "the lower end of the range of 200m to 300m euros previously guided", the airline said. Despite the higher profit forecast, Ryanair warned that market conditions remained difficult. Even so, the Irish-based airline said it would continue to pick up market share from rivals, and expected to do particularly well in Italy, Scandinavia, Spain and the UK. The company has been criticised for charging for a raft of extras on top of its basic ticket price. In an interview with the BBC, Ryanair chief operating officer Michael Cawley said such criticism was not a concern to the company when it was expanding so fast. Mr Cawley added that the fact passenger numbers had risen by 14% in the third quarter - with an expected seven million more customers predicted to fly with it in its next full year - spoke for itself. BBC News has contributed to the report.